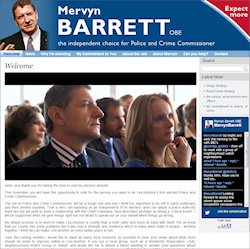 Toby Wallis Communications has designed and built a website for Mervyn Barrett OBE in his campaign to be elected as Police and Crime Commissioner for Lincolnshire. Featuring use of video, a blog, Twitter integration and many other facilities, this is a highly-flexible design allowing instant updating from almost anywhere. Mervyn chose Toby Wallis Communications because of the company’s performance record with the Magistrates’ Association, Probation Association and other related organisations. But the company’s ability to respond quickly to changing demands, and come up with effective communications solutions across a broad range of media, and within very short timescales, was the clincher.